There’s been a lot of excitement over blockchain technology and its relation to finance, especially regarding bitcoin and other cryptocurrencies. Bitcoin's value skyrocketed in 2017, ending the year with a value of more than $14,000 after starting 2017 at just over $1,000. And it’s not the only cryptocurrency to see huge increases over the years. While some believe that cryptocurrencies are just another bubble waiting to burst, others see them as the future of finance. What happens if we consider blockchain technology for cloud storage? That’s just what many startups are beginning to do. As we know, storage infrastructure has transformed to generally being very centralized. Rather than businesses and corporations hosting their own servers, many have migrated to the cloud. This turn toward centralization lets companies push workloads to larger, public clouds in order to utilize the storage infrastructure of large companies, like Amazon Web Services or Microsoft Azure. Because of the centralization currently inherent in cloud computing, resources could be shared and the end customer could have much lower costs and higher efficiency and uptime. With this, cloud computing has massively grown, with Gartner claiming that the “cloud shift” will affect more than $1 trillion in IT spending by 2020. 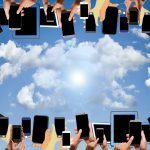 No one is doubting the benefits of cloud computing. However, data breaches or service interruptions aren’t unheard of, or even uncommon. Whether it’s user error or issues with the hosts themselves, data breaches in 2017 were a major story. For example, Verizon partnered with Nice Systems to handle customer service calls who utilized an unprotected Amazon S3 storage server. Because of this, 6 million records that held logs from customers who called Verizon customer service were able to be accessed. Another much more massive leak occurred when Deep Roots Analytics misconfigured their AWS server, releasing sensitive information of 198 million Americans. These failures aren't a one-time occurrence and they show that cloud computing’s model of centralized storage isn’t as secure as it could be because it has a single point of failure. If you are storing your company’s information in the cloud, you are placing a very large amount of trust in these third parties, particularly if your data is especially sensitive. That’s why many are predicting that, even though centralized cloud computing has many numerous advantages, the cloud might switch to a distributed, decentralized approach. And this is where blockchain technology for cloud storage enters the picture. Cycling back to the idea of client-server computing, workloads will still be centrally managed and controlled with a blockchain approach. Essentially, even if processing the data is physically distributed, the workloads remain logically centralized. This is different than a hybrid cloud approach where companies maintain data both on the public and private cloud. Blockchain creates a decentralized and distributed storage marketplace. Blockchain technology for cloud storage can be a rather complex data structure to understand. 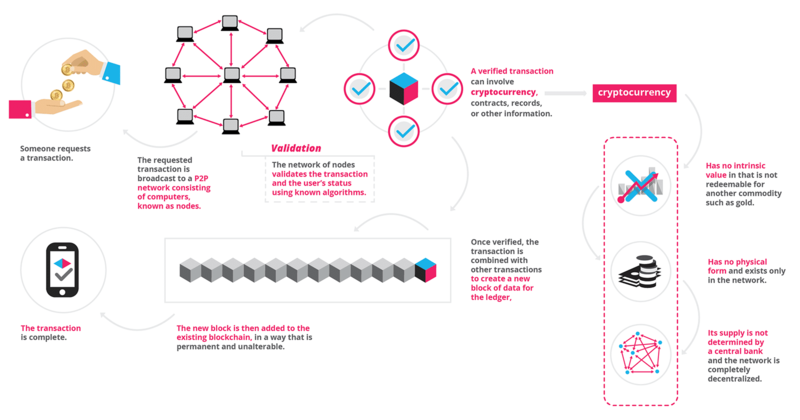 This graphic from Blockgeeks helps explain it a bit. There could be quite a few benefits of blockchain technology for cloud storage. First, as mentioned, it’s completely decentralized. While Amazon S3 makes sure that files are spread out among their regional datacenters, accomplishing redundancy, these datacenters are still a large point of failure. Instead, with blockchain, your data is fully decentralized because it is stored on multiple nodes across the globe. This helps to give users more protection in case of error in storing or transmitting data. Another problem blockchain could solve is that it helps users have more privacy because the data and user files aren’t fully controlled or accessible by a single third party. Instead, encrypted fragments are spread across multiple nodes controlled by keys that the users hold. This means that any nodes that hold your data are unable to look at them because it’s heavily encrypted with a key that only you (or the data owner) has. Additionally, even if the host node did somehow find a way into your file, it’s only a partial file, so it wouldn’t be compromising. The last, and, for many people, one of the most important aspects of this shift would be the lower costs. With the currently available options, Blockchain storage comes in at about $2/terabyte/month, whereas Amazon S3’s is priced much higher. Currently, there quite a few decentralized cloud platforms, including Filecoin, MaidSafe, Siacoin, and Storj. Their websites claim that they are superior to centralized cloud storage because they have greater uptime, security, and lower costs, and most have videos that help explain the technology to new users. Each of these platforms functions by renting out any unused hard drive space around the world. In fact, you can rent your own extra space to earn money if you’d like. Just as Uber utilized cars so they could be at their full potential (i.e. more frequently being driven by those in need of a car when the owners didn’t require its use), these technologies want to utilize hard drive space to its full potential. While prices from large providers are relatively arbitrary, being the same, set amount regardless of available storage, the price with these decentralized cloud storage platforms will go up and down depending on supply and demand, which is both a potential advantage or downfall. Additionally, the large providers set out to make a reasonable profit after paying not only their employees but also after building their very large facilities in many areas of the world. Because blockchain technology utilizes pre-existing servers, these decentralized platforms don’t require this large investment, enabling both the company and end user to save money. Whether you think bitcoin and other cryptocurrencies are a bubble waiting to burst or not, most believe that blockchain technology has proven itself. So, given its supposed increased security and decreased costs, can blockchain technology become the preferred cloud storage option of the future? Actually many believe blockchain has not proven anything. The technology is almost 10 years old and has not delivered anything of utility (I don't count the bitcoin bubble as utility, except to the profiteers). The fact is that all that these blockchain services claim to accomplish, can be done without blockchain--just more cheaply and efficiently. Few people, except for a fringe group, care about whether the technology is "decentralized" or not. Furthermore the idea that you can replace the storage providers with a service that uses "unused disk space" on people's computers is ridiculous for many reasons. One being the network traffic involved. Another being that greater redundancy would be required to allow for me to take back my "unused disk space". Finally, when you use cloud storage you are paying for a lot more than just the physical disk space.